Products used: E747 Easter Greetings, G452 Easter Lily. I stamped the lily image onto some patterned paper before distressing the paper and inking the edges of it. 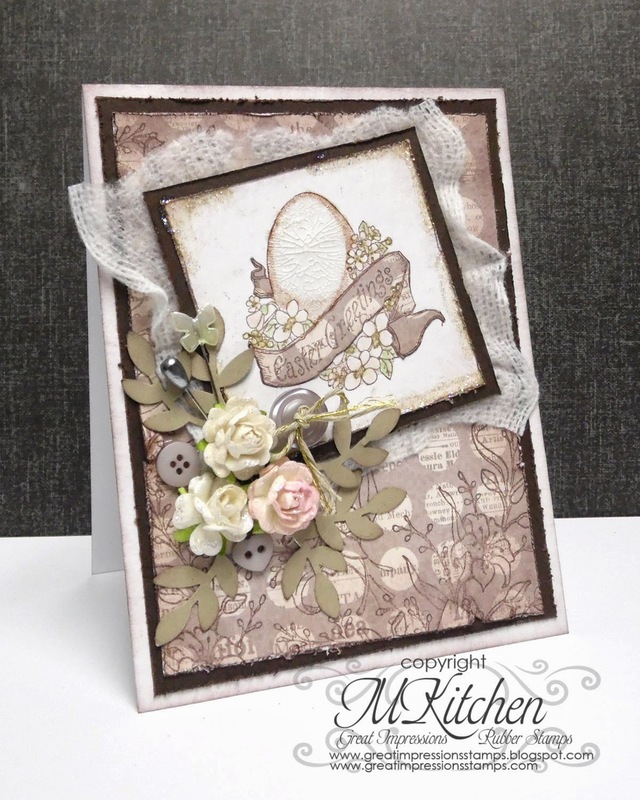 The egg image was stamped onto white natural card and then colored in with light inks. I distressed and inked the edge, added some Crackle Accents, and paper pieced the banner. I layered the egg panel on top of some gauze and then added a fun floral spray in the corner to top it all off. Thank you so much for stopping by to take a peek! Next week I'll be back with another creation for your viewing pleasure AND a video tutorial! I hope you'll participate in our monthly challenge and if you use GI stamps, make sure to add it to our Customer Gallery, too! HUGS and happy stamping to you all!